The government has said that it will guarantee all deposits held by the embattled Northern Rock bank. The pledge by Chancellor Alistair Darling is an attempt to reinforce confidence in the beleaguered firm. More than £2bn has been withdrawn by customers since the bank applied for emergency funding from the Bank of England last week. Northern Rock shares were 40% down at one point on Monday and ended 35.4% lower as fears grew for its future. Banks are already covered by the Financial Services Compensation Scheme which protects 100% of the first £2,000 in any bank and 90% of the next £33,000 - giving a maximum payout of £31,700 if a bank did go bust. But under the measures unveiled by Mr Darling, Northern Rock savers would not lose a penny, regardless of how much they had deposited. The chancellor reiterated comments made by the Treasury and financial services watchdog the FSA that Northern Rock is a solvent business. However these reassurances have not stopped anxious savers from queuing outside branches of the bank to make withdrawals. Mr Darling said that people could continue to take money out of the bank, but that if they choose to leave it there it would be secure. The decision to guarantee all deposits came, he said, because he wanted "to put the matter beyond doubt" and "because of the importance I place on maintaining a stable banking system and public confidence in it". FSA chairman Callum McCarthy told the BBC that he welcomed the move. "The purpose of this is not to save Northern Rock per se," he said. "It's to make sure that there's not a negative effect on the banking system overall." Northern Rock has booked advertisements in Tuesday's national newspapers and they will read: "Your money is safe with us. If you want some or all of it back you will get it back. But if it stays with us it is secure. "These have been troubled times but Northern Rock will prevail, we will not let you down." The firm says that it has not used any of the Bank facility for funds offered to it. In London, Northern Rock's shares, which had lost 32% on Friday, fell from 438 pence to 282.75 pence. Shares in other mortgage banks also suffered, with Alliance & Leicester slumping in late trading to finish 31.3% lower. Bradford & Bingley shares were also down, losing 15.4%. It is understood Northern Rock was almost sold to rival bank Lloyds TSB over the summer. The lower the Northern Rock share falls the easier it would be for a rival to take it over. Experts at Lehman Brothers said in a statement: "Any interested buyer appears to be in a strong position over price." Have Your Say: Bank worries? Northern Rock branches had opened at 0800 BST on Monday - an hour earlier than usual. Chief executive Adam Applegarth told the BBC he could not discuss possible takeovers, nor would he confirm the exact amount of cash withdrawn from bank branches since Friday. The BBC's business editor Robert Peston said the £2bn withdrawn - which represents about 8% of the £24bn deposits it held on Thursday - was actually less than the mortgage lender and officials at the Bank of England and Financial Services Authority had feared. Not all Northern Rock branches have seen big queues on Monday. No one at all has been queuing in Belfast, Bournemouth, or Swindon. The BBC has learned that Lloyds TSB and RSB were very interested in acquiring the beleaguered firm. Mr Darling said the emergency lending facility offered to Northern Rock would be transferred to any new owner. 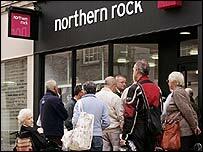 Northern Rock has struggled to raise money to finance its lending ever since money markets seized up over the summer. Are people right to take their money out from Northern Rock?